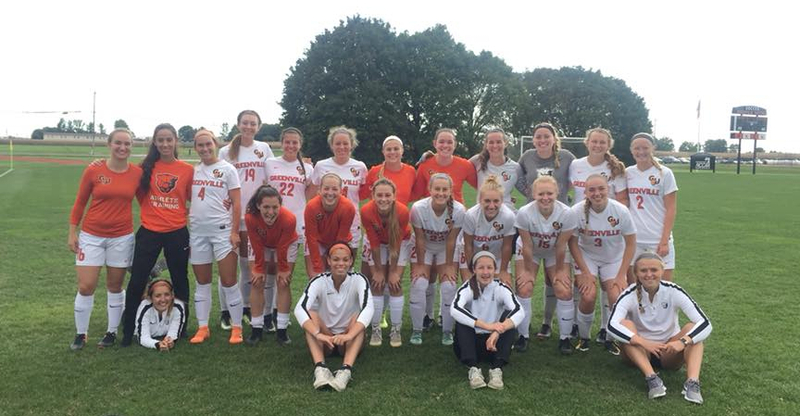 The Greenville University women’s soccer team has finally entered the conference portion of their season, and this past Saturday they competed against Iowa Wesleyan University in their first of many conference games. The Iowa Wesleyan Tigers came into the game with a record of 2-3 compared to our Lady Panther’s record of 7-3. It was each team’s first conference game so there was a lot on the line in trying to make a name for themselves among the other SLIAC teams. The game was played at 3:00 P.M. at the S.W. 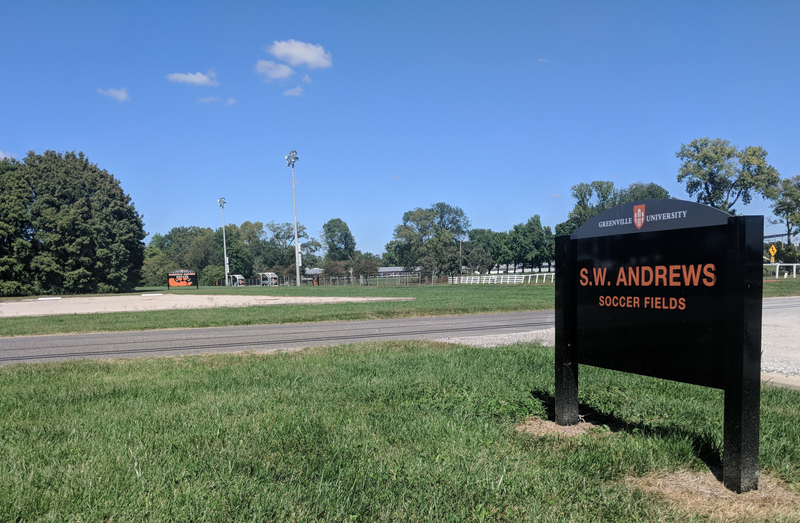 Andrews Soccer Fields here in Greenville and turned out very favorable for the Lady Panthers, as it resulted in an enormous 9-0 win for the team! It was a dominant team effort overall with 29 of Greenville’s 45 total shots being on goal, compared to Iowa Wesleyan only getting off 4 shots throughout the entire 90-minute game. Senior, Dani Pearce celebrating with her teammates during the game. Media from athletics.greenville.edu. 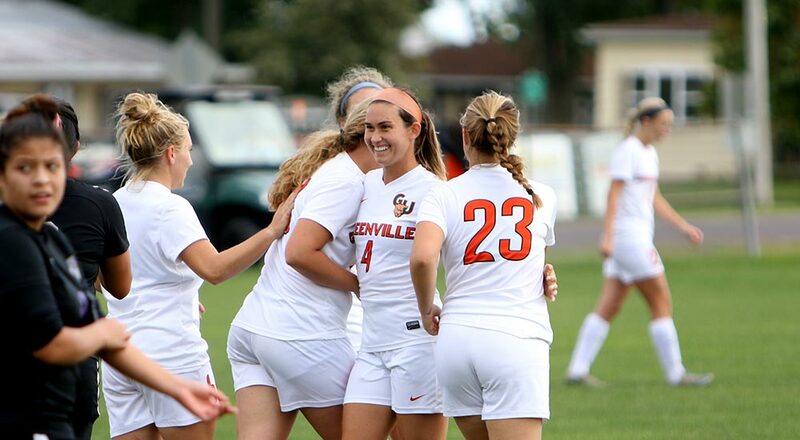 Greenville’s offense, like many other previous games this year, was led by senior Dani Pearce, who ended the game with a hat-trick of 3 goals on just 4 shots. Sophomore, Kate Arthur and junior, Breanna Thomas also played large roles in the teams offensive arsenal, with 2 goals and 2 assists for Arthur and a single goal and assist from Thomas. The remaining 3 goals were scored by senior, Maddie Saffel, junior, Ellie Cummins, and freshman, Kat Stroot. Defensively, the Lady Panthers had a pretty relaxed day as the goalkeepers only faced 3 shots on goal of the Lady Tigers’ 4 total. Junior goalie Marjory Coates provided the team with 2 saves, while freshman Reaghan Lesh came up with the third. 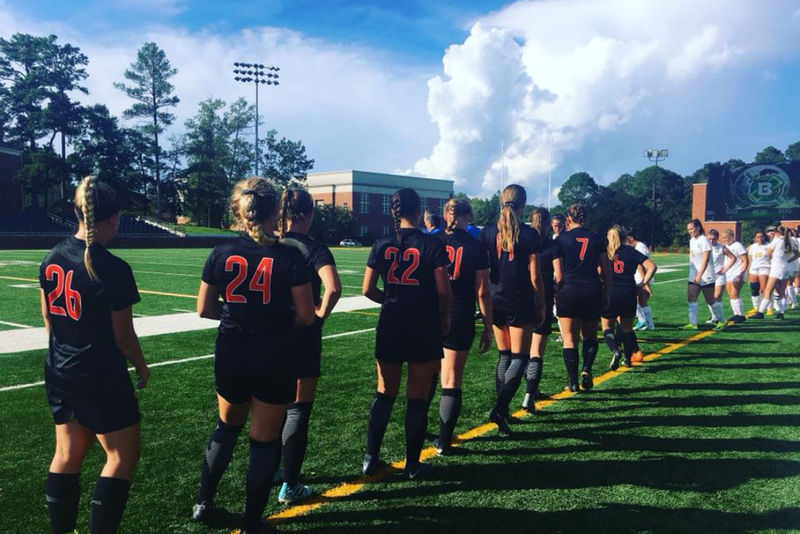 This is now the 6th game out of the 11 played this season that the Lady Panthers have not allowed a goal. The Lady Panthers pose for a picture before their first conference game. Media from facebook.com. Because of the steep scoring margin in the first half of the game by the Lady Panthers, nearly every active player got into the game to share the victory, and the team was really able to work on their chemistry as a whole unit. I was able to ask sophomore, Courtney Lawrence for some of her thoughts after the game and she explained that it was a great first game to open up conference play that really helped boost the team’s confidence for their attacking. Lawrence also added, “We were able to work on being clinical and use what we had learned in practice.” A win like this is always a good time to see what the team’s role players have to offer and with the team having many players struggling with injuries this season, some younger players have had the chance to step up into the spotlight for them. One great example of this was the freshman, Kat Stroot getting the opportunity to score her first collegiate goal just under 17 minutes into the first half of the game. The site of all home soccer games. Media by Gavin Jordan. After starting off conference play with a win, the Greenville women’s soccer team now holds a record of 8 wins and 3 losses on the season and hopes to carry the momentum they’ve gained with them throughout the remaining games. They have 8 more conference games in October, including another home game against Blackburn this Wednesday at 7:00 P.M. If you want to stay up to date with the results and statistics throughout the remainder of the season, go visit their official website for more information! Next articleWhich is the Best Dorm?